Autographed and Out of Print-Import! 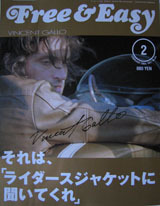 This large Japanese magazine features Vincent Gallo on the cover. The six page spread is filled with many photographs of Gallo. Text is in Japanese only. Cover is autographed by Vincent Gallo.